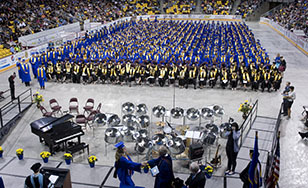 Spring commencement ceremonies will take place at 2 p.m. Saturday, May 14 at Amsoil Arena, 350 Harbor Drive, Duluth. The combined baccalaureate, master's and doctoral ceremony will have 915 candidates for graduation. A total of 579 bachelor's degrees, 249 master's degrees, and 87 doctoral degrees will be awarded. The day will begin with the College's traditional Catholic Mass at 9:30 a.m. in the Mitchell Auditorium on campus. Commencement Brunch will be held from 10 to 11:30 a.m. in the Greenview Dining Room in Somers Hall on campus. The keynote speaker at commencement will be St. Scholastica alum Jordan Sramek, founder/artistic director of The Rose Ensemble, a musical group that performs and preserves rare music from around the world using voices and ancient instruments. The Duluth Scottish Heritage Pipers will lead the graduates in the processional and recessional. Musical selections will include an Honor Song performed by Wolf Clan, an American Indian Drum Group, and a performance of "America the Beautiful" by tenor music department instructor Bill Bastian accompanied by music department chair LeAnn House. Graduating student Bianca Aspin will sing a musical selection, Rodgers and Hammerstein's "You'll Never Walk Alone," with accompaniment from Emily Valine, class of 2013. The commencement address will be delivered by David Ohnstad, the 2016 Student Leadership Award Recipient. Commencement ceremonies will be immediately followed by an alumni reception, hosted by the St. Scholastica Alumni Association, in the Harborside Ballroom at the DECC.